Fun Rapids inside a Unique Scenic Volcanic Gorge. The Goodwin Canyon rafting run starts just below Tulloch Lake on the Lower Stanislaus River and flows through a unique volcanic gorge. 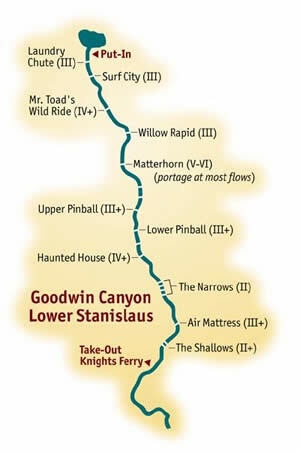 After meeting near the quaint town of Knights Ferry, we take the short shuttle to the starting point for the trip. Under towering cottonwood trees and impressive cliffs rising from the water’s edge, we take several minutes for instruction before loading into the rafts and beginning our descent. Tight shoots winding between lava boulders, giant fig trees, river willows, and alders, provide a dramatic and exciting introduction to this short and wild ride through Goodwin Canyon, one of the best late summer / early fall Class IV runs in California. After negotiating an exciting Class III rapid and just seconds from put-in, we come to Mr. Toad’s Wild Ride, a long Class IV rapid that requires an on-shore scout and careful planning by guides and guests before committing to the current and pull of this major drop. This big rapid makes even the most experienced rafter nervous because of its length and power. The next event on this river occurs at Matterhorn, an eight-foot vertical drop that requires a short fast portage. After enjoying the twists and turns of Upper Pinball and Lower Pinball rapids we come to the abrupt and intimidating Haunted House Rapid, a narrow slot where the entire river drops seven feet into a frothing reversal in front of a truck size boulder. The threat of flipping on this notorious rapid is always looming. The final part of the trip is spent maneuvering through fun Class II and III rapids flowing between tight rock walls. Killer Guides and overall experience! "Rapids were amazing and guides were at the top of their game. Food was a level or two above what I expected. The canyon scenery was quite spectacular."